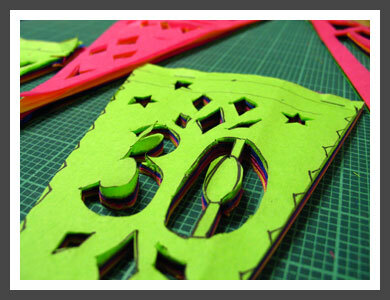 I started this blog a month ago, just a few days after celebrating my 30th birthday, and I've been promising to post images of the invitation and decoration I designed for the event since then. Well, I've finally gotten around to preparing the images. Enjoy! 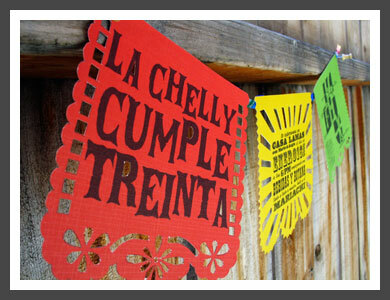 First, a little about the theme: being of Mexican heritage I wanted to celebrate my 'doble-quinceaños' (double fifteen- 30th) with a large celebration, so a typical Mexican 'pachanga' (party) was a must. 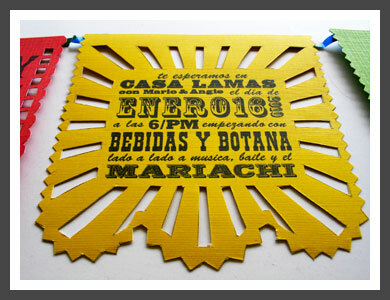 I wanted to use typical Mexican decor, but with a modern twist, so of course there had to be Papel Picado, Piñatas, colorful streamers & tableware all with Mexican-inspired motifs. 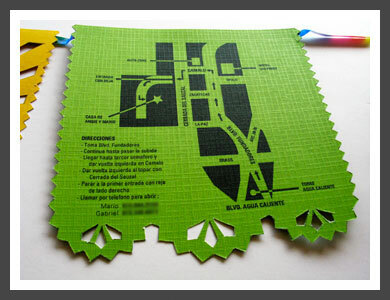 I spent many hours researching for the invitation, not necessarily all Mexican design, though, and this is what I kept close as I designed. I started out by loosely sketching out a few different comps for the motifs and placement of the text. I then went into Illustrator and cleaned up the design and elaborated the various elements. 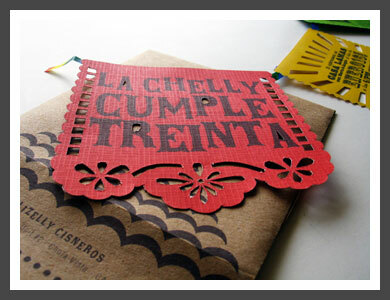 I initially had a very complex design, but when I started to cut each section out by hand (I had to cut out each invite individually rather than in stacks of multiple sheets because the paper was thicker than the usual tissue used in Papel Picado) I knew the design had to be simplified. I still kept with some of the floral motifs and scalloped edges found in the traditional designs, but I printed out the text rather than cutting it out due to time constraints. 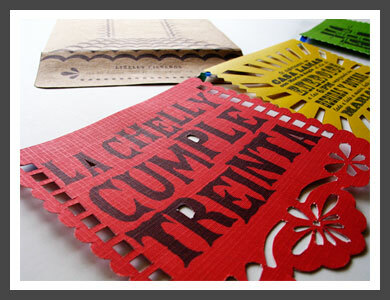 For the envelope I used craft paper and printed a motif that would accentuate the designs on the other pieces. 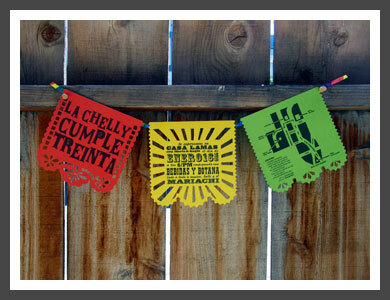 I chose to use three banners to create a complete Papel Picado garland and placed the necessary information on each. The introduction, the pertinent information such as time, place, and what's going on, and the map. I had a great response from my invitees about the design. I'm glad they enjoyed receiving it as much as I enjoyed creating it. At the end, I might have had blisters on my fingers from all the cutting with the Exacto, but that's just proof of the time and effort I put into creating them. :) Thanks to my love Gabriel, soriameza.com, for his insightful collaboration. 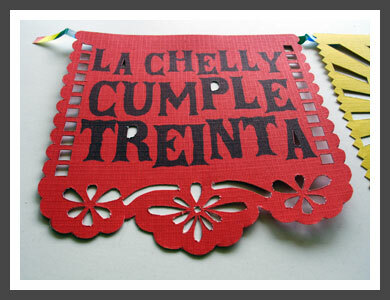 Stay tuned for pix of the party decor: Papel Picado garland, colorful Pom Poms, and saint-style Decorative Candles. Here's a sneak peek! i'd totally be thrilled to get that invite in the mail ;) well done! why thank you miss Anne. 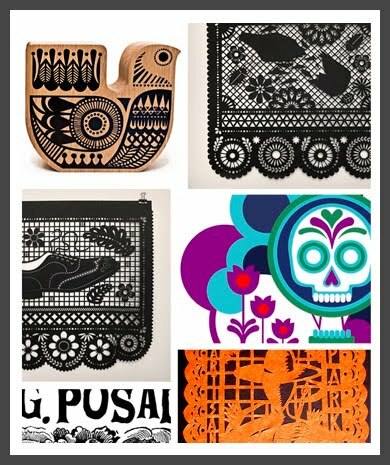 making these really brought a new appreciation for paper cut-out designers like Rob Ryan and Julie of Famille Summerbelle...wow, and I thought this was hard to cut! !